Give a truly unique present suitable for any occasion and any person by purchasing one of our Virtual Gifts. You will be sent a card from one of our amazing dogs with a thank you message and space to fill in the recipient’s name. An envelope is also provided. Your £10 pays for new toys for young puppy Jiminy to play with. Not only are they lots of fun to play with, they will also teach Jiminy key skills that will later be used to help a disabled person lead a life with greater independence. 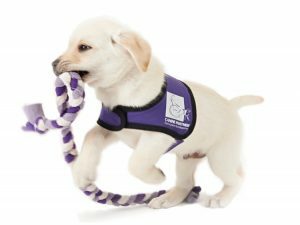 You will receive a card from puppy-in-training Jiminy which you can personalise and send to a family member or friend. A £25 gift pays for a snuggly new dog bed for puppy in training Teddy to snooze in. 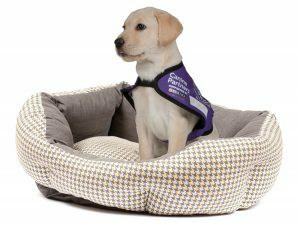 This bed will keep Teddy cosy throughout his first year whilst staying with one of our puppy parent volunteers as he begins his journey to become a canine partner. You will receive a card from puppy-in-training Teddy which you can personalise and send to a family member or friend. A £50 Virtual Gift will make a great difference for our puppies, as it pays for enough food to feed one puppy for a whole month. 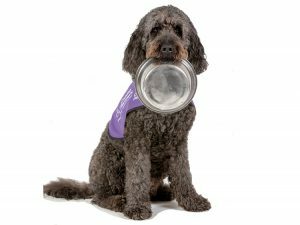 Tasty, nutritious food is vital for an assistance dog in training to keep them going as they learn the key skills that will transform lives. You will receive a card from demo dog Doyle which you can personalise and send to a family member or friend. If you would like to buy a virtual gift for a friend or family member, please fill in the form below and a member of our team will be in touch.